WHAT’S NEXT FOR THE PINT BILL? It was a good day for the Pint Bill yesterday in South Carolina. First, the House had its second reading of the bill. It adopted the simple linguistic amendment that the House Judiciary committee had proposed. That passed without issue. Then, things got a little more dicey. Rep. Ralph Kennedy and Rep. Rick Quinn, both of Lexington, moved to amend the bill so as to only provide for 16 ounces of beer for on-premises consumption. Practically, that’s no different than what we have on the books now. By a vote of 65-48, the amendment was tabled. A vote was then taken as to reading the bill, as amended, a second time. That passed 71-32. Now, the bill need only be read in the House once more to pass. 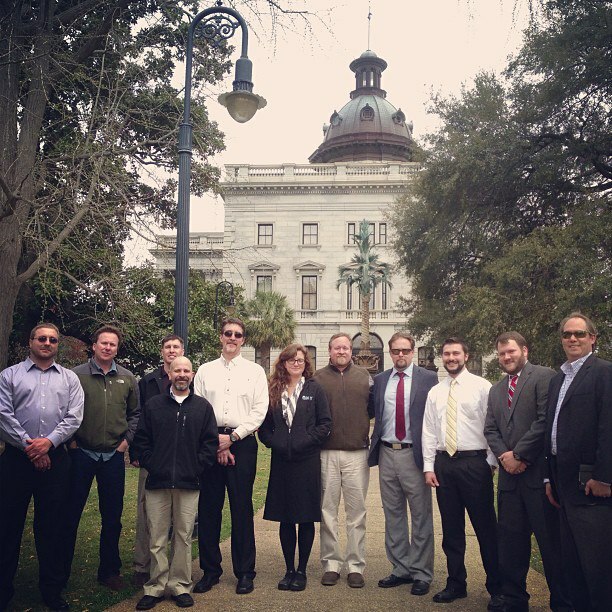 The other news of yesterday was that many South Carolina brewers came to Columbia to testify in front of a Senate Judiciary subcommittee on the benefits that the bill would provide. You might notice a few familiar faces from above. The picture is courtesy of Palmetto Brewing. Representatives from Palmetto, Coast, Holy City, Frothy Beard, New South, Quest, Brewery 85, RJ Rockers, and Thomas Creek were all in attendance. The measure passed the subcommittee, with the only amendment being the linguistic amendment that was also adopted by the House. It has no dramatic impact on the bill. Some opposition was voiced as to enforcement by certain groups, but the committee did not make any changes to the bill on that front. It now goes to the full Senate Judiciary committee with a favorable recommendation. Once the bill clears the full committee, it goes to the Senate floor. If it passes two readings, it is good to go. Assuming no other changes are made on either the Senate or House side after both pass their respective bills, it goes to Governor Haley for signature. If one side makes a change that the other does not, then a conference committee will be needed. Session is supposed to run until the end of May to start of June.